It can be difficult to know what’s appropriate or meaningful when it comes to funerals, whether you’re trying to figure out what to say to someone who is grieving, what to wear when attending a memorial event, or even what to send to a family when expressing your support. For those who are lucky enough not to have attended many funerals, or those who are attending a new type of life celebration that they’ve never been to in the past, these decisions can feel even more daunting, because you have nothing else to compare it to. One way that many people are choosing to break away from funeral tradition, but still show their support and love to grieving friends and family, is to send a unique sympathy gift instead of a traditional funeral floral arrangement. The right comfort food or delicious sweet not only has the power to heal the stomach, but also the soul. So when times get hard, there are few things that offer more feelings of satisfaction and warmth than a hot, delicious meal, like the cheesy, familiar taste of Lasagna, or the always-delicious Chicken Marsala. So why not next-day ship these comforting treats off to to someone who could use the extra support and love? The truth is, giving the gift of food during a time of loss isn’t just a tradition because it’s a delicious idea… it’s also practical. When someone has just experienced something as significant as a loss, they don’t always have the time or the energy to focus on making themselves a hearty, warm meal, so sending one of these comfort foods to them to show your support can be a much-welcome gift. 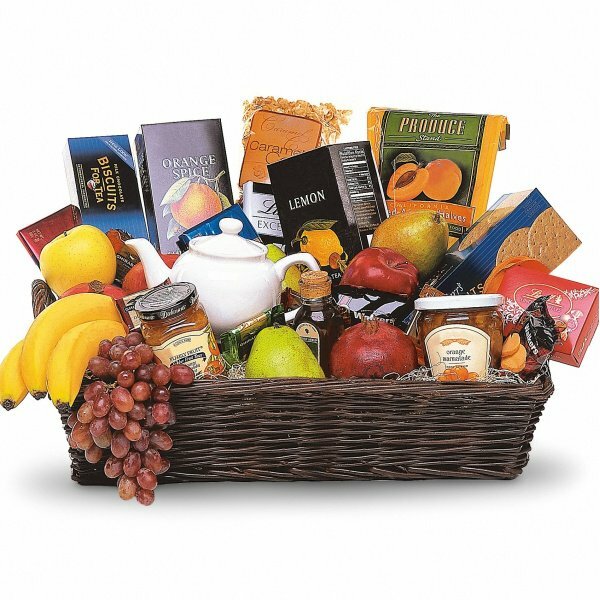 Or if you think that their life might be a bit too busy and overwhelming to even heat up a fresh meal, there are also a number of amazing gift basket options out there that are made up of comforting sweets, chocolate, fruit, or even a mix of all three! Whatever you choose, you can’t go wrong by filling someone’s heart (and stomach) with support through familiar foods. Just like how many people often forget to feed themselves with delicious meals that comfort their stomach, many people who are going through a time of grief and loss also struggle to find time and energy to take care of themselves, as well. But sometimes, something as simple as a relaxing bath, a much-needed foot massage or even a warm cup of tea can go a long way towards healing the mind and the spirit. If you are looking for a way to help extend the gift of self-care to someone who really needs it, consider giving them a gift certificate to a local spa, or even sending a spa gift basket right to their home so they can care for themselves in a safe, relaxing space. Some of our favorite spa baskets out there include the whole nine yards when it comes to pampering yourself, including shower gel, body lotion, delicious cookies, warm tea… everything you need to begin healing the soul. One of the greatest gifts that you can give to someone who’s grieving the loss of a person who meant so much to them is to give them a gift that represents their loved one. Maybe it is something simple, like a framed photo of their loved one with a beautiful memory hand-written on the back. Or maybe it’s a one-of-a-kind tribute blanket that features a hopeful poem or meaningful prayer that can continue to lift their spirits throughout their grief journey. There are so many amazing, personal memorial gifts out there to choose from when it comes to representing a person’s life story or memory. Just make sure that whatever gift you choose is both meaningful and healing to the person you are gifting it to, and reminiscent of the life that you are honoring. For example, one of our favorite gifts is a pack of memorial seeds that loved ones can use to create their own memorial garden at home, or in a place that is meaningful to them. This is a great way to represent the life of someone who may have been a gardener, and it’s a gift that their family will be able to enjoy for decades to come. What better way to hold someone you love close to you than to honor them with a gift such as a beautiful bracelet or necklace? A personalized jewlery option, or even a stunning sentiment of faith, is the perfect way to show your sympathy and support, while also gifting someone something that they can hold on to forever and keep close with them each and every day. You can even take the gift of closeness one step further by giving one of your loved one’s the gift of cremation jewelry. This is a meaningful and one-of-a-kind option for anyone whose loved one was cremated, as the jewelry holds the ashes of their loved one inside the jewelry itself, and can be worn around the neck or the wrist, depending on the jewelry option that you choose. You can’t ask for a gift more personalized, or that offers a better opportunity for closeness. Last but not least, one of the most meaningful and impactful things that you can give to someone when they are going through a difficult time is a jump start at healing. There are a number of amazing grief books and healing resources out there that make the perfect support gift to adults, children or anyone who may be experiencing a significant loss. Not only do these amazing resources help to show someone who is in the darkness that there is a light at the end of the tunnel, but it also is extremely healing for someone to know that they have a friend out there who understands what they are going through and wants to help them on their path towards healing. What are some of YOUR favorite sympathy gifts, outside of the typical funeral flower arrangement? Be sure to share your thoughts with us in the comments below! Also be sure to check out the Sympathy Store for all of the gifts that we mentioned above, along with hundreds more that were selected specifically to support your loved one during their time of need. Love your suggestions. I think handwriting jewelry would be something one can cherish! e.g. something from greeting card or a note they wrote and engrave that text on a bracelet. Wow beautiful sympathy gifts! What do you think of memorial gem stones and fingerprint pendants? These are beautiful sympathy gifts and they are great for support. I agree that a personalised memorial gift is a very powerful and meaningful way to show support and sympathy. Alex, thanks so much for the comment. I am glad you found these ideals helpful!